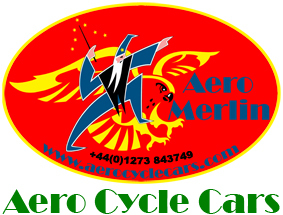 Aero Cycle Cars reserve the right to alter kit specifications without notice. 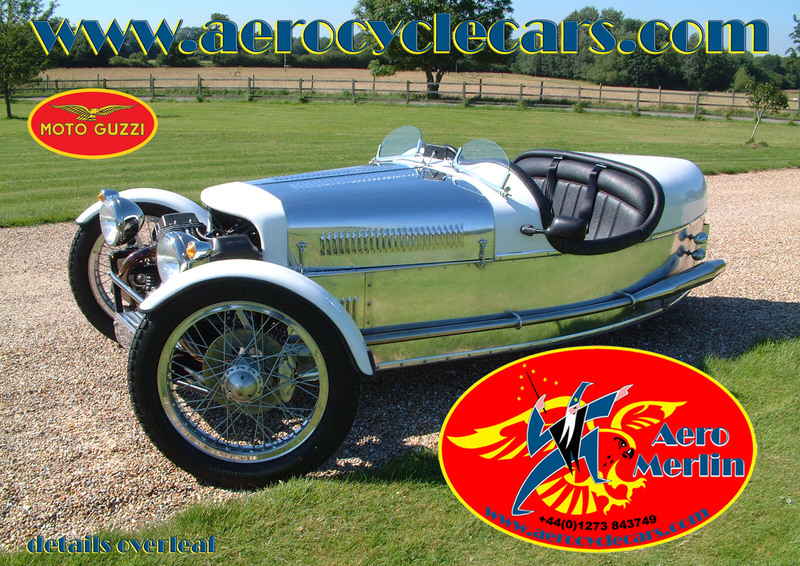 Aero Cycle Cars manufactures the Aero Merlin, Beetleback and Barrelback model The Aero Cycle Car is a classic replica of the Morgan style three wheeler. Aero Cycle Cars use Moto Guzzi engines, in a space frame chassis clad in aluminium. Aero Cycle Cars are uniquely handmade three wheelers recreating the flair and nostalgia of the 1930s. Why Aero Merlin? 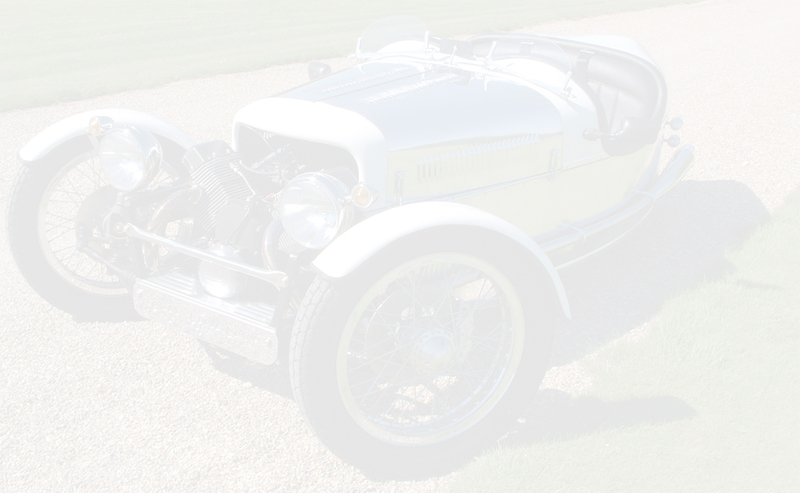 Not only did Morgan themselves call one of their own models "The Aero", but I decided long ago that the three wheeler fits in with my aviation interests in general, and my interest in all aeroplanes powered by the Rolls Royce Merlin engine. 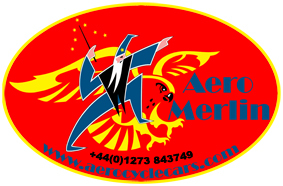 The company logo reflects Merlin the bird after which the Merlin engine was named of course, and Merlin, the "Arthurian" wizard. A complete car fitted with a low mileage Moto Guzzi drive-train commences at £25,000. A starter kit, Kit 001 with a powder coated chassis, all grp components (3) and all aluminium panels all pre-cut and trial fitted, £3995. We also provide a fully comprehensive kit with all items enabling a build to test standards (not including the Moto Guzzi components which will come from your donor bike) £14,995. Click here to read this.... you will need to comply. MSVA (Motorcycle Single Vehicle Approval) is the approval test for a vehicle built within the UK. You need an MSVA certificate to register your car. 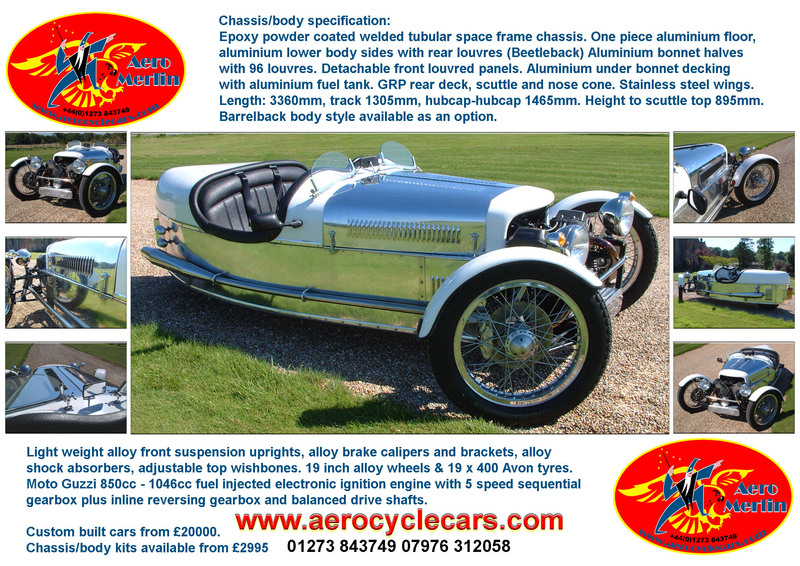 The Aero Cycle Car is a two-seater, open cockpit, sporting car in the tradition of a 1920s Triking type cyclecar. The Aero Cycle Car is similar to the Morgan Three Wheeler.